"The Heart of the Amish" invites readers into the world of a people renowned for their ability to forgive. 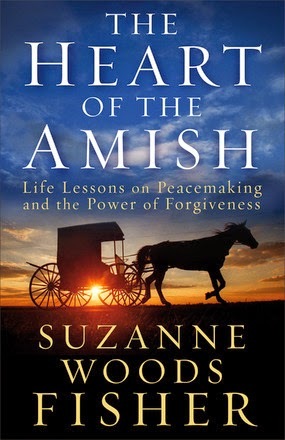 Through true stories gathered from a variety of Amish communities, bestselling author Suzanne Woods Fisher illustrates how they are able to release their pain and desire for revenge, and live at peace with others. Her in-depth, personal research uncovers the astounding yet fundamental way the Amish can forgive anyone from the angry customer at the grocery store to the shooter at Nickel Mines. Readers will learn how to invite God into "their" stories, apply lessons from the Amish to their own circumstances, and find the freedom that comes with true forgiveness. This isn't my first review of a book written by Suzanne Wood Fisher and I strongly suspect that it won't be the last. She's long been a favorite author and when you combine that with my love of Amish books, well, there was no way that I was going to turn down the chance to read this one. Every chapter starts with an Amish proverb and ends with a section of reflection questions. It's honestly not a bad idea to keep a journal/notebook and pen right on the nightstand with this book. Unless you're crazy like me and sometimes just write directly in the book...which I've been told is a sin... Either way, filled with wonderful stories, proverbs and a chance to reflect on your own life, this book is going into my refer back to bin.